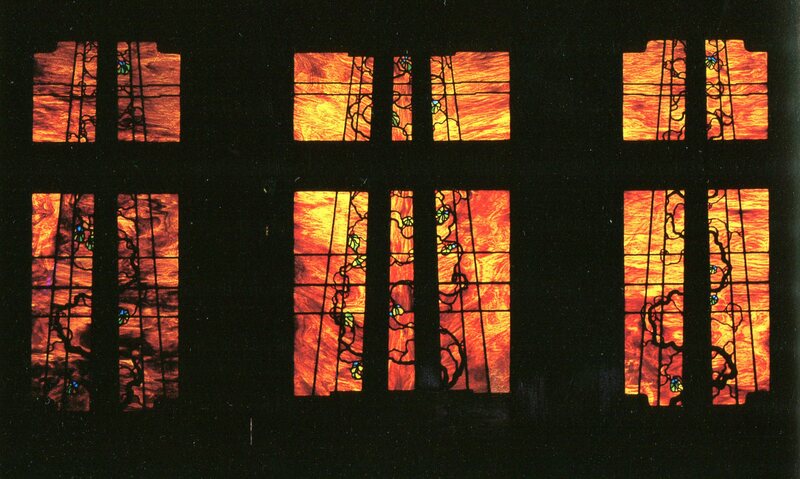 window and light panels, almost always consisted of stylized clouds or vines. Birds, trellises, leaves, flowers and berries accented the glass panels. All were all impressionistic representations, while Wright’s glass design elements were crisp and precise. The Gamble House front door is an excellent example of the organic shapes made possible with the cooper-foil technique of Tiffany and the use of layered glass. The door features iridescent glass on interior surfaces layered with opalescent glass on the exterior surfaces. 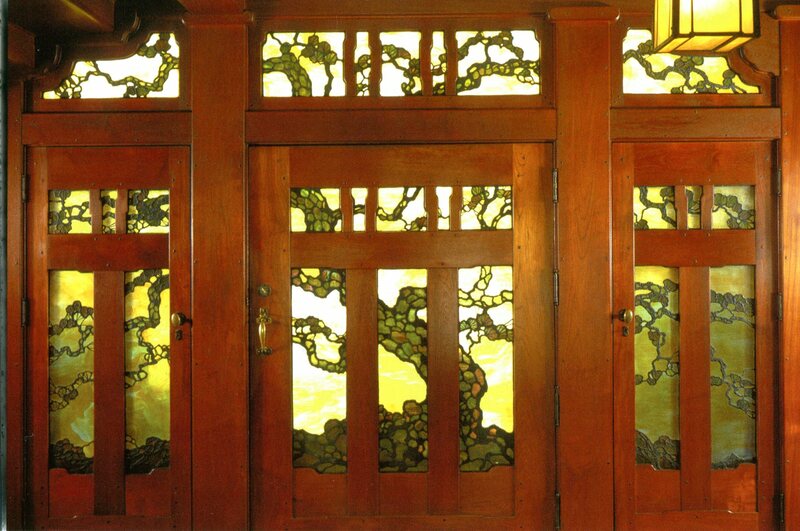 By the time the Gamble House (1908) was built, the Greenes’ magnificent front door included a Pasadena oak tree, but abstracted to such a degree that the tree’s leaves are gingko leaves instead of oak leaves. Another good example of their layering of iridescent glass is the Blacker House, Pasadena, CA, which features three layers of glass: iridescent on the outsides, “sandwiching” opalescent glass in the middle. The triple-layered glass was done only for the Blacker House, which was an over-the-top House in almost all respects. It’s an amazing example of their craftsmanship and design eye; the scale is quite large – roughly 9′ high by 10′ wide. The entry shows off the influence their contemporaries had on their work as well, from the copper-foil technique of Tiffany that allowed for organic shapes and the abstracted natural elements from Wright. The Greenes were truly suited for the Gamble House project, perfectly timed as their careers had matured, yet they remained open and interested in the art of others to bring their best to bear on this historical project. Email or call me at 626-221-5244 to create custom Arts and Crafts stained-glass art panels and windows in the Greene and Greene style.